Listen, we can only begin to imagine how hectic life is when you become a mum for the first time. In fairness to the gorge Vogue Williams, she makes it look easier than it is. And thankfully, she's not afraid to admit that it isn't all walks in the park and adorable selfies. Last night, the blonde bombshell took to Instagram to share a really honest post about what life is like as a new mum. 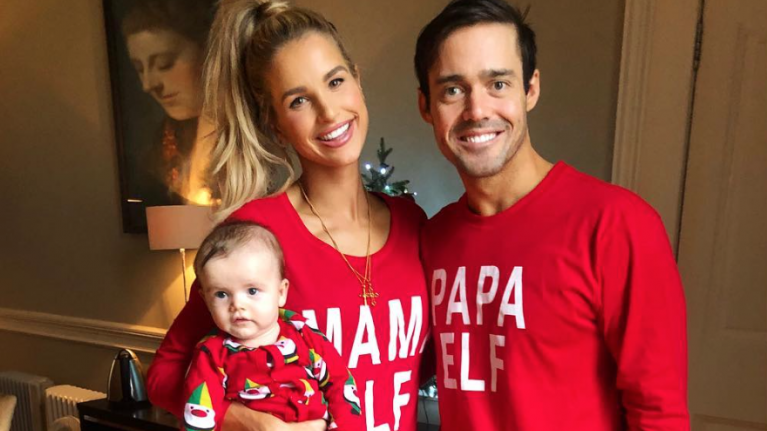 The DJ shared a cute snap of her husband, Spencer Matthews, holding their baby son. "Still smiling after 90 minutes sleep, a teething baby who had a cold lingering." "We thought we were great that he was sleeping through at 5 weeks. Little did we know a sleep regression was coming!" "I love being a parent more than anything in the world but WOW it’s not the easiest!" "How the little piggly was still smiling and laughing away after such a short amount of sleep is beyond me." And fans and followers were quick to comment, sharing their own stories of motherhood, and even giving Vogue some advice. "Sleep honestly changes, will get better soon and then you totally forget. Sleep deprivation is soooooo hard!" wrote one helpful follower. Everyday with my boys is the BEST day ? "I know exactly you are feeling. My girl was born on the same day as your little man (it is the main reason why I follow you). She wasn’t sleeping through at 5 weeks but was when the sleep regression hit after her 16 week jabs." "We are still not back to where we were before but I think she is changing her pattern as she is going down earlier but hasn’t quite got it to go through to the next morning." We so admire Vogue Williams for her honest approach to parenting!